What constitutes something perfect, be it a work of art, a memory, a relationship? Is the “perfect” something even attainable? The ancient Greeks drew a distinction between the “best” and the “perfect.” Something like “harmony” is closer to what the Pythagoreans sought from their notion of perfect objects. (Harmony could also be a stand-in for “balance”—both are categories more easily understandable than absolute.) Christianity would have us believe that the perfect is a state to be striven towards, a place reserved primarily for the all-knowing, all-seeing. Humans are, by some, alleged as nature’s most perfect creation, because of our symmetry and faculties though I’ve seen leaves on the ground pleasingly proportional enough to shred that notion. In physics, “perfect” is only ascribed to scenarios known impossible to exist. Is the idea of perfection, then, a personal or aesthetic dead end? And who decides where “perfect” is, anyway? Surely all of this discussion must end up revolving around the ephemeral, the personal, and the uncategorizable. What does it mean to say that Flowers of Shanghai is perfect? And how could one apply the label “perfect” to the cinema of Hou Hsiao-hsien, which is often improvised around a basic structure or, like Flight of the Red Balloon, created almost wholly from scratch? The definitions and questions could go on. But I do think there is something to this idea of “perfection”—whether it is harmony, balance, quintessence, or the like. Humans require it as an idea to explain our endless striving against stagnation, death, and boredom. Even though his vistas have changed through the years, the basic building blocks of Hou Hsiao-hsien’s cinema have not: his films are formed around the marriage of concentric circular unities—conceptual, formal, historical—that jostle with each other for primacy, then recede only to push for renewed attention later on. At his best, the Taiwanese master performs this balancing act admirably, leaving one with a sense of rigorous order and balance amongst the constituent parts, so much so that the films seem not comprised of “parts” at all. Great Hou is seductive, yet somehow ungraspable—how does one find purchase on smoothly geometric works of indeterminate shape that juggle the grandness of real “history” with the intimacy of love affair? Ambitious filmmakers are often forced to use ambitious strategies (note “ambition” need not connote “complication”): Three Times danced through three scenarios representing three different epochs in the national story of Taiwan, but uses the same lead actors to underscore the film’s onion-like architecture; growth in City of Sadness was incremental—from Hirohito relinquishing power over Japan to the 228 incident, Hou’s characters found themselves caught up in the repetitive historical march of oppression and bound visually by their puppetmaster’s epic tableaux; in Flight of the Red Balloon, the Taiwanese director’s recent Parisian excursion, his camera floated balloonlike around the confines of Juliette Binoche’s cluttered apartment and the lives within it, illuminating without penetrating, and ultimately mirroring the unmoored but thoroughly bound world it documented. Hou’s stalking, feline camera (think of a more circumspect, at times almost menacing Béla Tarr) is his cinema’s most instantly recognizable quality. This constantly shifting perspective remains perfect for glimpsing how his various historical levels constantly impact each other in subtle, often imperceptible ways (sometimes invisible depending on circumstance: most Western viewers won’t know that by the end of A Time to Live and a Time to Die, the language spoken by most characters has morphed from Mandarin to Taiwanese). History, especially Taiwanese, viewed from the perspective of those living it, may be his most lasting contribution to cinema, though given the vitality of his recent foreign excursions, it’s hard to say where he’ll end up. But all this neatly gift-wrapped unity of form and content has left Hou a little slippery, and his entry into art-house prominence here in the U.S. has been overshadowed somewhat by a long-running and rich film festival circuit mythology. Most who care to know had read about Hou long before they’d seen a frame he’d shot, and the near simultaneous availability of a bunch of his works here on DVD in 2001 and 2002 coupled with retrospectives and critical hosannas created a breathlessly rarified situation in which his films, especially the Nineties works, may have become more intriguing as objects to witness and admire than art to examine. Non-traveling cinephiles weren’t given the chance to grow with the artist, understand, say, how the weight of City of Sadness contributed to the several-year break between it and its follow-up, The Puppetmaster. The relative dearth of knowledge most western viewers possess about Taiwan coupled with his lush visual schemas only helped further exoticize his filmmaking. It may be his recent internationalist films that have allowed us the keenest insight into Hou and the body of prior work he’s produced that’s still largely unavailable to American viewers. (It must be noted here that his critical approbation has far, far outstripped his commercial viability—not an uncommon state of affairs, but one that remains edifying.) On even the most purely tactile level, Hou’s probably been more consistently great than any filmmaker of his generation making movies today. He’s churned out a steady stream of masterpieces and great films for nearly two decades, yet right now I’d argue that it’s his closing work of the Nineties that may well be reckoned his best long after he’s gone. Months before I’d see the film, Phillip Lopate’s lengthy gush over Flowers of Shanghai (a quote from which figures prominently on the DVD artwork: “A visually ravishing masterpiece…one of the most beautiful films ever made”), Hou’s, yes, visually ravishing (and highly exoticized) look behind the screens of a turn-of-the-century Shanghai “flower house,” hooked me on the idea that it would be the film, the kind of experience that for cinephiles is akin to holy visitation. My initial attempt to see Flowers of Shanghai was foiled: I’d planned a trip to New York with a college professor in October of that year to see the film and some others at a Film Society retrospective that was cancelled the morning of the screening. Frustrated, I waited and plotted for months until the film’s appearance in Boston in the spring of 2000. The print was as gorgeous, warm, and lush as the day outside was grey and uninviting. The opulence of late nineteenth-century flower houses (upscale brothels), in which behavior is governed by ritualized codes and standards, was certainly worlds away from the life of a college senior—I’d effectively been transported. I remember a stunned, quiet ride home. Flowers of Shanghai seemed perfect, well worth the lengthy quest to see it, or perhaps it was even closer to the unattainable because of it. It’s toward the end of Flowers of Shanghai that Hou reveals the relentless perfection of his designs. 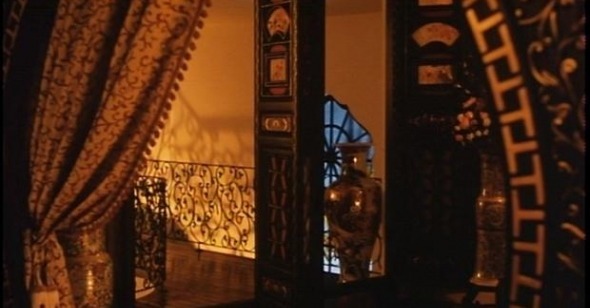 Up to that point, the film’s been icily cozy: the production design, centered on a handful of ornate rooms lit by the warm glow of oil lamps, is as inviting as the similarly elaborately dressed “flowers” and patrons who occupy the spaces. Each scene in the film is punctuated by a long, luxurious fade in or out of black, and the swelling or ceasing of the circular score by Yoshihiro Hanno and Du-Che Tu casts an appropriately narcotic haze over Hou’s interlocking narrative strands. For all his film’s enveloping qualities, Hou keeps us balanced—inside the walls of the compounds, with their multiple frames and mysterious doorways to elsewheres never seen, yet outside of their inhabitants’ minds—stalking his camera around group gatherings in which a mysterious rock-paper-scissors-esque game is played drunkenly and loudly while intimate exchanges occur between consorts. Late in the film, Mr. Wang (Tony Leung Chiu Wai) suspects the primary object of his interest, Crimson (Michiko Hada), is spending an evening with another caller in retribution for the attention he’s lately paid the younger courtesan Jasmin (Vicky Wei). He stumbles into her quarters, drunk and belligerent where he’s held at bay by Crimson’s servants. Left alone, Wang drops to the floor to look under a scrim separating the apartment’s quarters. Instead of hanging back like an interloper and maintaining his long shot, Hou fades to black, and then unexpectedly, back in to Wang’s perspective as he looks under the scrim revealing the clothes of another man. After what seems an unbearable wait, Hou fades out and back in to the master shot of the room. Maybe what we (or I) look for in a “perfect” film isn’t so ephemeral at all—merely an artist willing to stick to an aesthetic tack rigorously, even at the expense of immediate narrative ease or satisfaction. The fade here is an amazing gesture because it’s totally illogical within the confines of conventional cinematic grammar. On the heels of this, the film’s most radical formal gesture, Wang proceeds to tear apart Crimson’s suite in a miraculous single take—this quick sequence highlights Hou at both his most formal and visceral. Wang’s mad but obviously embarrassed—at his drunkenness, at his show of emotion, at the ultimate stumbling ineptitude of his violence, at the price he knows he’ll have to pay to repair the physical and emotional damage he’s done. Hou’s circulating camera captures it all (kudos to cinematographer Mark Lee Ping-bin, for keeping the image legible even after Leung’s shattered the practicals that provide most of the scene’s lighting), but it helps the moment greatly that the filmmaker has already located himself and his characters within a hothouse system of multiple bondages. The “flowers” are doubly bound: first to their madams (or "aunties"), and then to their primary callers, who are expected to support the flowers’ households. Hou then layers on further complexities: women who’ve grown old within the system and see no need to escape it; another who looks for a way to buy her freedom; yet another who lucks into a marriage with a witless young caller and another, more dubious, kind of freedom. All of the women strive toward different lives, different options, but all of these possibilities are thoroughly and oppressively mediated by prevailing historical conditions. For all the men’s obvious economic and physical power over the women, Hou seems generally unconcerned with explicating the male perspective here—in this liminal space the bound women have an odd kind of upper hand. Even the film is divided thusly, with recurring chapters named for each of the main women, yet the movie never feels like a collection of short stories. Hou’s formalism irons their disparate stories into a unified whole. Critics don’t often label films perfect. Our job is, in fact, to prove every film imperfect. We go to the cinema with our ideal movie in mind and then gradually add and subtract points as the viewed object wears on. Is calling Flowers of Shanghai “perfect” hyperbole? It depends on who you ask. For me, the film evokes a sense of restful calm, a communion of sorts achieved by few other films, even those that I might love more (“better” films). If artists, filmmakers, writers, actors, don’t strive for perfection, have they failed? And does Hou strive for perfection in his films? One can imagine a youthful allegiance to a kind of unity governing his employment of near-static frames in his early films, but if the camera can’t move, they’re not encompassing, not perfect. Hou’s relentless pursuit of elegance led him to abandon the static tableaux for his now inexorable roving camera, which allows for a different informational register, one that’s less ordered moment to moment but more unified as a whole. Hou’s cinema didn’t achieve perfection with Flowers of Shanghai—his style has continued a forward evolution that’s revealed further depths of nuance, more finely tuned sensitivity to the rhythms of time and place, and greater command over cinematic form. But Flowers of Shanghai still stands out. Even Flight of the Red Balloon, though it may represent a “better” employment of his now trademark looseness, has an air of ragged spontaneity that Flowers never allows to enter its utterly controlled humid atmospherics. Perhaps it’ll be remembered the way I remember Robert Bresson’s Trial of Joan of Arc—as that unnecessarily hermetic experiment, so full of integrity and rigor that it sparked a fantastic late career run of creativity. Maybe it’s perfect for reasons too personal to really articulate—and maybe that’s where perfection truly lies.